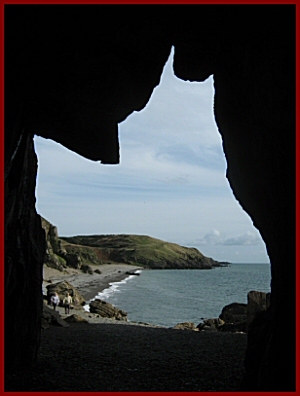 One of my favourite ‘holy’ places is the cave of St Ninian on the east side of the Whithorn peninsula in Galloway. To get to it one has to get out of the car at Physgill and walk. The path takes us down a small wooded glen before we arrive at the stony beach and the waves of the sea. Turning right and looking up a little we see the cave at the end of the beach. We still have a hard ten minute walk on the shingle before we get there. But to sit in it, all alone, ah, what a pleasure! People are, naturally, wary of romantic imagination. But a disciplined use of the imagination is permissible. The peace and quiet at this cave encourages indulgence. Was St Ninian ever here? We do not know. But after a little while of prayer we feel he is here. On the walls of the caves are early crosses picked into the stone. 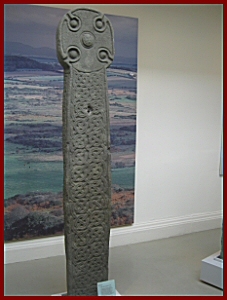 A number of ancient cross slabs were found here now in the museum in Whithorn. The cave has brought people here from early times. As we look from the cave along the beach across the bay we can see why. It is always with reluctance that we leave such a place. There is much more to St Ninian than his cave. 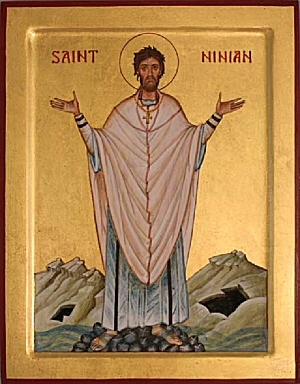 Tradition says that St Ninian converted both Irish and Picts -the first had moved here, the second lived here. Details of St Ninian’s work however are not clear. Bede states that Whithorn was the place of the monastery established by him in the 5C. Excavations provide evidence of a thriving early Christian community from late that century. Small rectangular wattle buildings and a circular oratory were found, one painted with lime-wash.
Whithorn eventually became an important centre with its own monastery, one or more churches, and a school. The Northumbrians took this over in 8C. Before this however Irish Christians had come to settle; and before this we get the distinct impression of a Roman based tradition here. 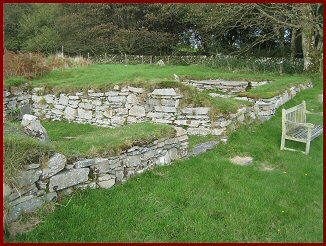 The very name ‘Shining House’ (Candida Casa) mentioned by Bede may best be interpreted as a building of well-dressed stone in the Roman fashion. If St Ninian was a bishop and a Briton, as Bede says, he could not have come from anywhere else but south of Hadrian’s wall. Whithorn has an easy sea connection with south of the Solway. It may well be that the small community there was numerous enough, in the very early 5C, to request a bishop from Carlisle. 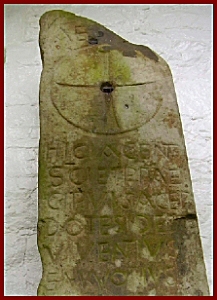 In the museum at Whithorn is an inscribed tombstone which begins: ‘Te Dominum laudamus’, ‘we praise thee, O God’. It belongs to a man with the Roman name of Latinus. This stone is usually dated to 450. Latinus is described as a ‘nepus’, ‘grandson’, which takes us back a further two generations of family life in the area. If this is true we are back almost in touch with the Roman period itself! Further West on the ‘Rhinns’ of Galloway there is a church on a hill at Kirkmadrine, where several other memorial stones have been collected together. One stone, with a Chi-Rho symbol and an alpha (the omega is missing) commemorates two holy and outstanding bishops named Viventius and Mavorious. This is more hard evidence of the spread of ongoing church life beyond the Empire. A similar stone remembers two men, possibly priests; one of them was called Florentius. Another stone, now lost, commemorated a deacon, Ventidius. The fourth stone bears an encircled Chi-Rho symbol with the words ‘Initium and Finis’ (‘Beginning and End’) the equivalent of ‘Alpha and Omega’. Here, almost off the ‘map’ (the end of the Mull of Galloway lies just down the road), are tomb-stones of sub-Roman British bishops, priests (and deacons). When the Romans went the ancient sea routes of the West flourished again. Irish were already settling in Wales before the end of the 4C. Irish from Ulster began settling here in Galloway about the same time. But, with the influx of monks in 5C, little islands from the Scillies, Wales to Scotland were ideal for solitude and prayer. 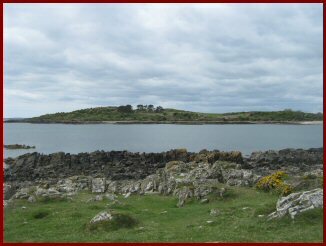 Monks found the isle of Ardwall, nestling on the edge of the Bay of Fleet near Kirkcudbright. It had already been in use as a Christian cemetery from 410 onward. In these early times only perishable materials were used for building churches and the cells of the monks. At Ardwall the postholes of the first small wooden church date to about 550. More exciting is the finding of a wooden tomb-shrine of a saint, typical of those found in Ireland. How we would love to know his name! The next wooden church dates to about 600; after this there is a tomb shrine made of stone; and, later still, a stone church dating to 7C. There are also hints of outdoor altars (Irish: leachta), for pilgrims,because the church was so tiny. The Irish continued coming. A little stone chapel and holy well was made for pilgrims right by the sea on Luce Bay in the 10/11C, – no doubt on an earlier site. They were dedicated to St Finnian who may have been a native of the area. Nearby, up the hill at Barhobble, a small Irish monastery with a wooden oratory began in 7C. After the invasion of the Vikings it became an Irish-Norse community, may have lasted to the 14C. The capacity for the Living Tradition to stay alive is quite remarkable. There are two more little Irish surprises. There is a cross in the churchyard at Kirkcolm north of Stranraer. 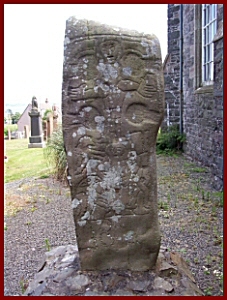 Kirkcolm means ‘the Church of St Columba’ and the cross is probably dated to 9C. The figure of Christ on the cross clearly shows him, arms stretched out, not in death but victory, – the Eastern/Irish way, ‘reigning from the tree’. Last but not least is the little holy well and holy tree dedicated to St Ciaran not far from Islesteps south of Dumfries. It is in a lovely quiet setting about a mile west of the village. 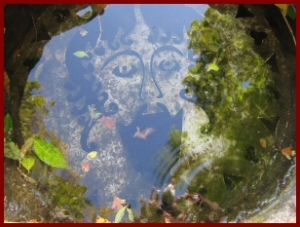 As we look into the water the face of the saint looks back at us! The impact of St Ninian is hard to quantify but the dedications of churches is very extensive. Some of these may be early or made by disciples. What he began in southern Scotland was carried on by them, by others like St Mungo and also by the many Irish saints who took the Gospel to the north and west of Scotland.